This month I have a theme. Travel. I’ve travelled quite a lot within Australia this year and worked out that I visited all but one of the capital cities for business, pleasure or a bit of both. Sorry Hobart, you missed out! …are lots of indulgent goodies from Perth. I went to the Eat. Drink. Blog. Conference in Perth in November and many of the things currently in the kitchen are from the gift bag provided by generous sponsors. I drank the wine in Perth as it was too heavy to bring back to the East Coast but most of the other items made it back. I’m looking forward to trying the Custard and Co small batch Apple & Plum Cider. This was made specially for the #EDB13 conference – how lovely to have something made just for you and 79 of your friends! 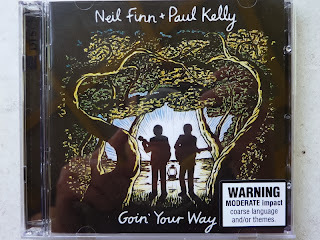 …is a new CD from Melbourne by Paul Kelly and Neil Finn called ‘Goin Your Way’. Gosh! I can’t remember the last time I bought an actual CD. It’s all digital these days. Paul and Neil toured earlier in the year but the tickets sold out in flash. When I was in a book shop in St Kilda the other day, I saw this CD in the window. I decided to buy it for Anthony as we had been really impressed by the Paul Kelly doco on the ABC a few weeks ago. It’s an easy listen and good for when we’re pottering around the house. I was lucky as it was the last one in the shop! 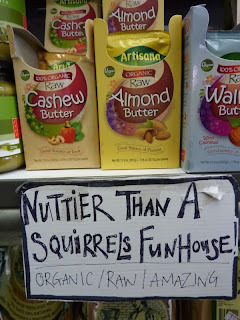 …is a packet of organic raw pecan butter (with added cashews!) from Fremantle. Why? I couldn’t bring anything big back home in my luggage, given the goodie bag above and truth be told, it was the sign that tempted me. I imagine spreading this on a biscuit with a slice of cheese or as some type of filling in muffins. Well that’s what I imagine. Maybe I’ll use it like tahini. Maybe. How good or bad could it possibly be? I haven’t opened it yet but we’ll soon see. …is a traveller from Fremantle. He has a twin brother who has winged his way to another part of Australia. I’m very fond of biscuit and cookie cutters. They are cheap and lightweight souvenirs of holidays and far flung destinations. North America is virtually the only place you can find novelty and souvenir cookie cutters in abundance but I still have quite a collection. I’m visiting the US in 2014 so will be hoping to add to it. In the mean time, I’ll content myself with this little guy. 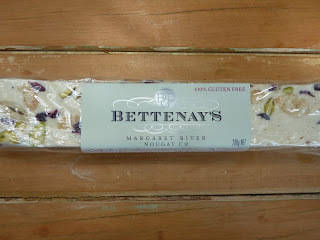 …is some pistachio & cranberry nougat from the Margaret River. There are plenty of wineries to visit in Margaret River but lots of other bite sized food adventures along the way. 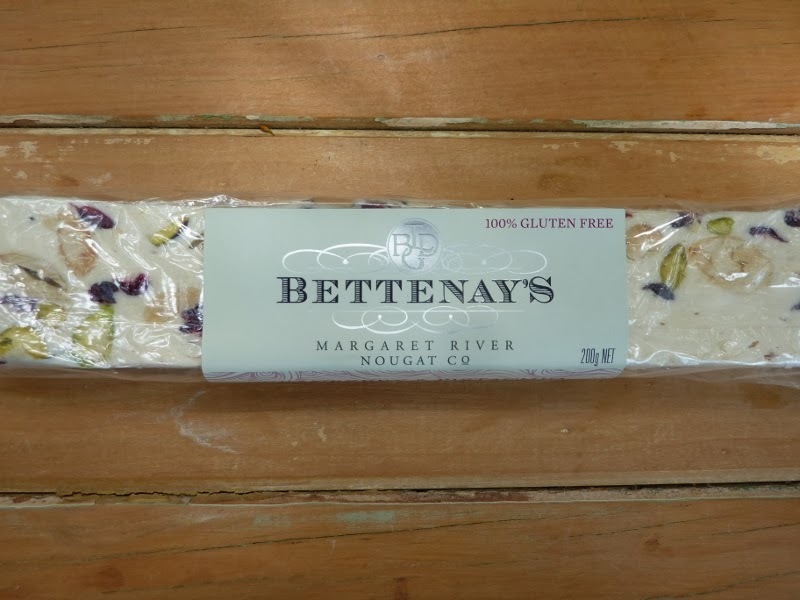 Bettenay’s is one such winery but they are fast making a name for themselves as the Margaret River Nougat Company. At the cellar door you can taste wines and nougat – the perfect combination! There’s no festive baking or sweet making happening this December as we’ll be away for Christmas. We will take the nougat to our friend’s house on Christmas day along with other treats but it’s a very low key kitchen this month. In My Kitchen is hosted on a monthly basis by someone who’s middle name is ‘Patience’, Celia from Fig Jam and Lime Cordial. It’s an opportunity for bloggers to talk about what’s happening in their kitchen and their lives and maybe include a few things that they haven’t had time to blog about. If you visit Celia’s blog, you can read about other In My Kitchen enthusiasts. What a wonderful array of goodies you have collected during your travels this year, Fiona! I hope you found some tasty goodies whilst in Adelaide! Do have a great Christmas! Hi Marian – I ALWAYS find tasty goodies and drinkies in Adelaide and SA in general! Fiona, may your low key kitchen month be relaxing and restorative. Sometimes a break from it all is the very thing that inspires. 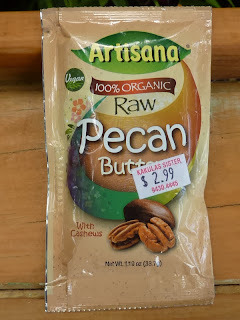 Pecan butter is one of my favorites (Oklahoma is a pecan growing region, too) and I hope you enjoy it. The idea of a winery that offers wine tasting & nougat samples sounds fabulous! Merry Christmas! Thanks Kim. I'm sure I will do some cooking but we will be house sitting over Christmas and I plan to relax before another no doubt hectic year. All the best. I like the idea of cookie cutter souvenirs, we normally buy stubby holders but realised when going through Europe that they are very much Australian so I have been trying to think of what else we could collect 🙂 Hope you have a nice relaxing Christmas. Hi Celia – it's a crocodile. Not very 'WA'. More 'Florida'. It looks suspiciously like the Lacoste logo. Thanks for a big year of hosting Celia – I've made so many new people via IMK. Cheers! Now you have me wanting to go on holiday – a trip would be just the thing right now. Fabulous goodies in your kitchen. I've already lined up the next one. What will I find I wonder? And I've drunk the cider now. It was so good – almost like a plum wine. Such a shame it was a small batch as I'd buy it all the time. Thanks for stopping by Nancy. Fiona, All these lovely things at my own back door. I feel bad I haven't discovered them myself. It's always the way isn't it? 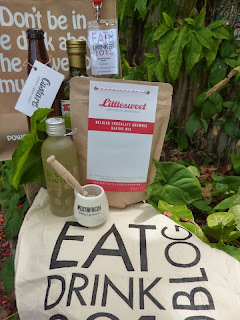 I can't say I know much about local Qld and Brisbane goodies! Enjoyed the peek inside your kitchen! That coconut candy looks yummy!! Hi Marianne – I've just checked for you and yes, I can confirm that coconut candy is delicious! I love the look of the coconut candy! What I have done was undid one so you could see inside – they are little brown squares. Yes, it's a bit of a fave. It's an enormous block but I bet there's none left at the end of Christmas Day! You are so lucky you got to go to Eat. Drink. Blog. I'm hoping to make it to the next one. I'm making mine up tomorrow for a family get together. They don't know how lucky they've got it! Wasn't it just so great to go to Perth. I tried the apple cider it was just delicious and very special. Next time show us some more cutters! Great idea MKS! I just booked the tix to the USA – maybe I could show a few a month until I next go. Thanks for visiting. Okay do you say skweril or squeeeril like my husband? We discussed this at Thanksgiving dinner the other day and the other American said, "Squeeril?? 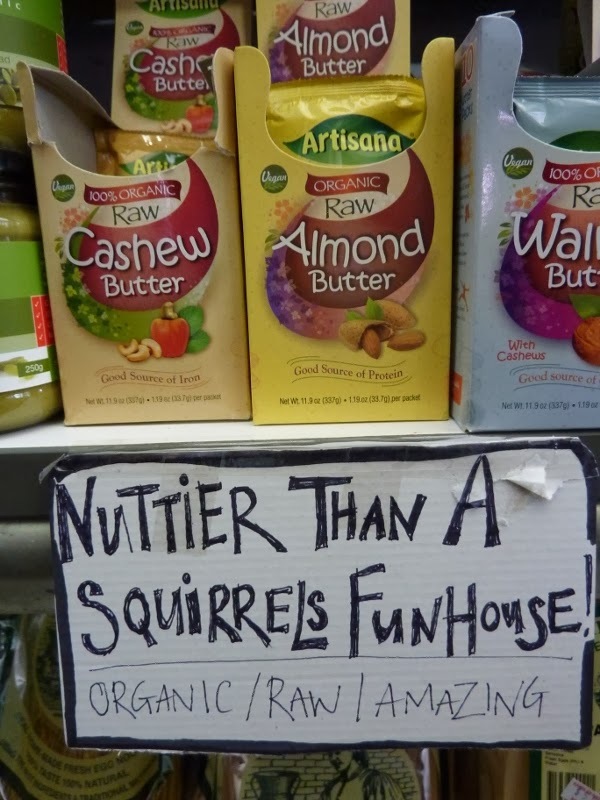 That's nuts!" We all roared. As I'm reading you comment I saying it out loud to see what it sounds like…'squeeril' to to me. Let's not get started on caramel! 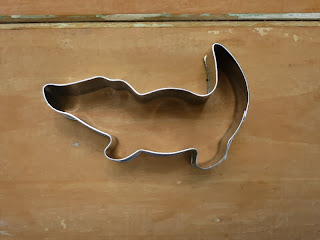 Have you seen some of the other posts this month with cookie cutters? #CookieCutterEnvy Have a great Chrissy Jason and save a bit of that fruit cake for me! I have a recipe for your type of peanut butter. I'll see if I can copy it across before I go away. And for the record…I saw squirrel with a short i as pin (unless you live in NZ) of tin. And no let's not get started of poor ol' Carmel!!! Thanks for the recipe. Sounds curious but then again, no different to Black Bean Brownies. oh Fiona, what a laugh that squirrel sign is! 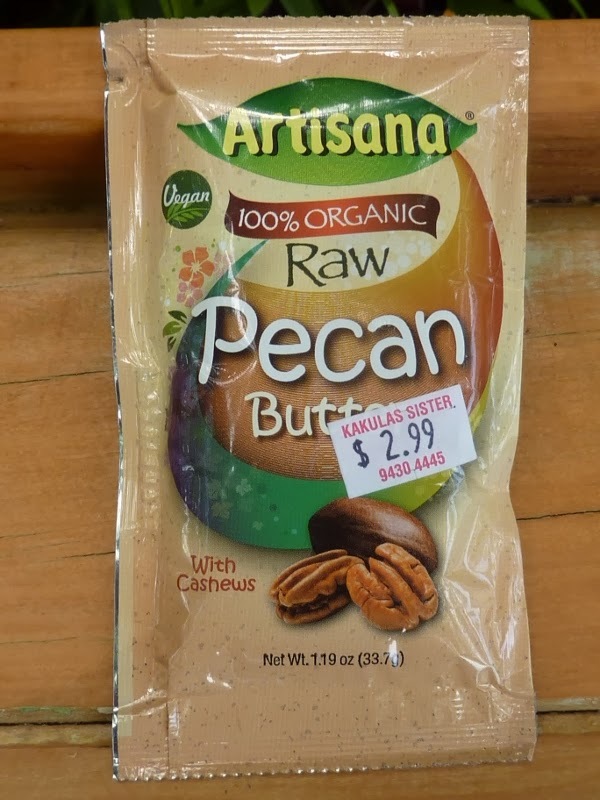 The pecan butter sounds most yum! Thanks Lisa. I have high hopes for the nougat…the jury's out on the nut butter. Hi Hi – I will certainly try to connect with some of my Canberra connections. In fact, I'll get a round robin conversation going now! Thanks for visiting and motivating me. 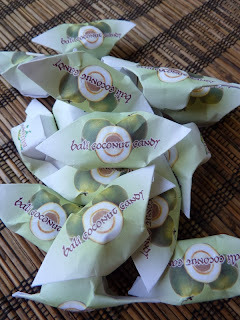 Love the eclectic goodies in your kitchen, particularly intrigued by Balinese coconut candy. I have a little less of that candy as one of my blogging friends asked for some and I was only too happy to share! Cheers Andrea – thanks for your regular comments and visits! 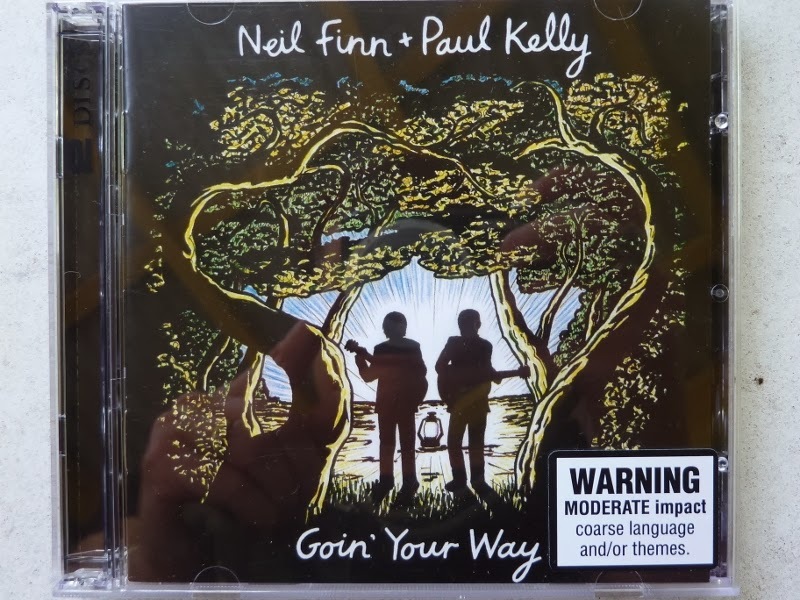 Hi Fiona, found you when googling the recent Neil Finn / Paul Kelly album, of which i bought a “smaller” vinyl version today, containing 10 of the songs. It was a record-store-week type of deal and since i like Neil Finn’s stuff i didn’t hesitate too long, despite not being sure who Paul Kelly actually is… anyway, i have good friends in Brisbane, and i love cooking myself so i subscribed to your blog as well, keep it coming! Hi Alex – welcome! I hope you enjoy Paul Kelly. Like Neil, he’s a wordsmith who tells the stories we’ve all experienced. Thanks very much for subscribing. As soon as my new kitchen is installed, I’ll be back in it and cooking up a storm! Pecans are a luxury! I love cookie cutters too, and that croc. this one is kinda awesome. I like the sound of the Balinese cookies, I am making some Balinese Chickpea Tofu soon. Have a super festive holiday, with lots of good home cooking. We loved WA and can’t wait to make a return visit.